This is my latest make for the Minerva Crafts Blogger Network. 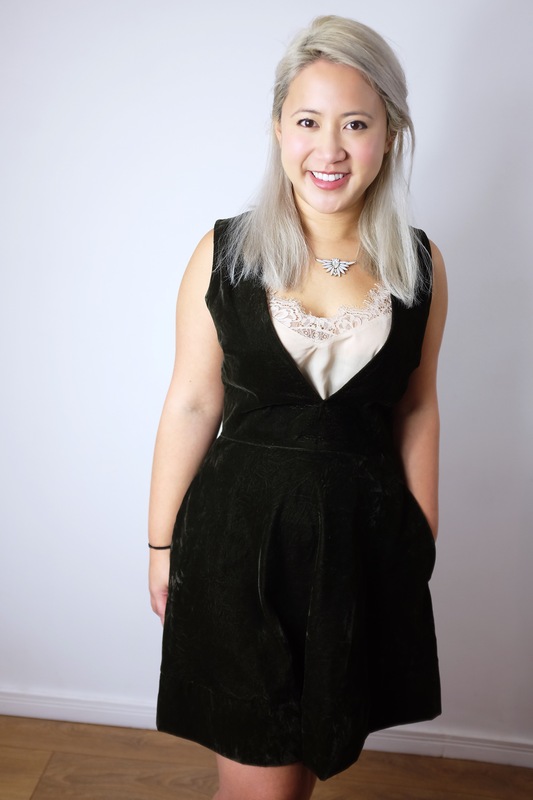 It’s a tunic dress made from Simplicity 1325 in a gorgeous olive green velvet. I’m already planning another one in denim! New Year’s greetings from EmilyAnn to Emily! I love the inset of lace contrasating with the velvet. When you make this in denim you can, perhaps, use top stitching in a contrasting color like yellow or red. Then you can use an inset or make a top to wear underneath that looks folksy with embroidery. You’re reading my mind! I was totally going to go down the folksy route with a denim one! I was thinking of embroidering directly onto the denim (or appliqué patches if I’m feeling lazy). A fun coloured topstitch would be cute with it too! Great minds think alike! I think for you pastel colors will look very boho. Pink roses, yellow daffodils, spring green ferns–appliques with those kinds of things and colors will give it a light touch. Loving the style of this dress and it looks amazing in velvet. I’m so tempted to try velvet (like silk and georgette) it scares me, thank you for the tips, I might jump in and give it a go.